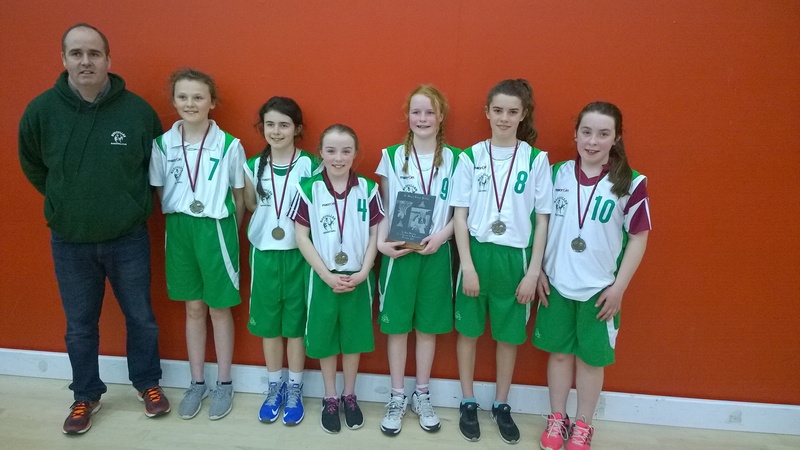 A selection of our U12 Girls pulled off a magnificent achievement in winning the Fr Sean Manning Memorial 3×3 Tournament in St Marys College on Friday 11th March. It is a highly coveted title and was toughly contested with eight teams starting in two groups. We won our three group matches, beating Barna 25-1 in the first match, followed by a 21-7 victory over Titans in the second match with the final group match played against Corrib Tigers whom we beat 15 points to 6. The semi final against Maree was a close end to end affair. Having led the tie for most of the match we fell behind by 1 point with 15 seconds to go. Laoise Curtin however showed great composure and attacked the Maree basket with a powerful drive, drawing a foul for which she was awarded two free throws. She held her nerve under immense pressure to convert one of her free throws to draw the match. The tie then went to a sudden death Free-Throw contest starting with the respective captains. Maree began with their captain who made her free throw followed immediately by a basket from Ruth O Sullivan. After a number of missed attempts it came back around to the captains and this time the Maree captain missed her shot leaving Ruth O Sullivan with a shot to win the match which she duly converted to great celebration. The final was a really entertaining and highly skilled tussle with our neighbours and good friends Corrib Eagles against whom we eventually prevailed with Moycullen finishing up winners with a margin of 2 in a score line of 12-10. All the players contributed hugely during the 5 matches. Leah Ruane and Eva Hackett combined their height and skills wonderfully to dominate the boards in both defence and offense. Eimear Burke terrorised the opponents with her magical dribbling, shooting and tenacious defensive interventions. Caoimhe O Sullivan seemed to pop up in every corner of the court making some brilliant passes and defensive saves and Ruth O Sullivan and Laoise Curtin dribbled, defended and scored like veterans. It bodes well for the group who are really beginning to find their form and can look forward to many successful years ahead. L to R: Barry O Sullivan, Eva Hackett, Caoimhe O Sullivan, Eimear Burke, Ruth O Sullivan, Leah Ruane, Laoise Curtin.